I had to post one more rainbow but didn't want to keep repeating myself, so I had a bit of fun with processing. 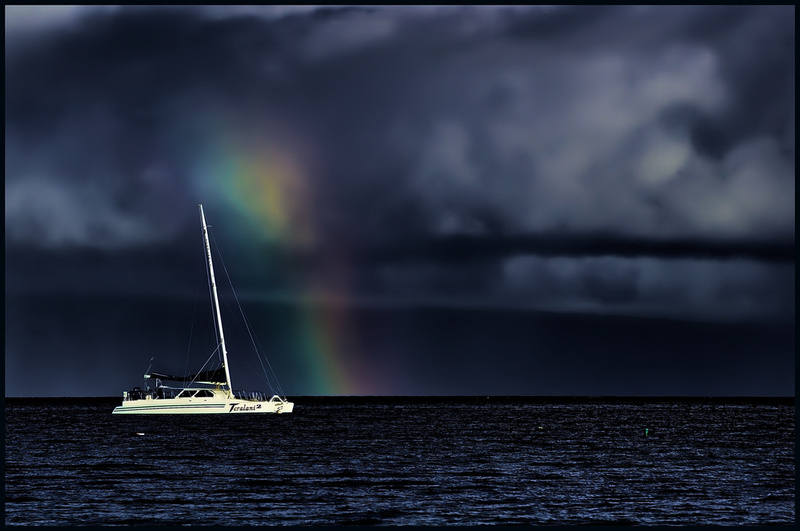 I liked the contrasts between rainbow and sky, sky and calm seas, and darkness and the white boat. It's one of those that while I know I like it, I'm not confident that it's a good image. This was taken as we were putting out to sea for our (very successful, stay tuned!) whale watch this morning. I really like how the line of the boat's mast runs parallel with the stripes of the rainbow. Lovely shot Taffy. A Fav from me. @aecasey @steampowered Thank you both so much, April and Paul! I didn't know if this was a ridiculous shot -- so dark for a rainbow -- and I really appreciate your comments and your favs. You've given me a boost -- best present ever! Enjoy your day tomorrow (or today for you, Paul). Wonderful shot Taffy!! Love the way the rainbow follows the shape of the boat!! Very dramitic sky but the boat really stands out!! Fav!! Incredible what a wonderful shot!!! Fab..fav! Love that dark sky! fav! beautifully moody tones... nicely done with the processing! This is your best rainbow shot yet. I love those dark moody tones. I saw this on the trending page and thought of you! Great shot and processing!! Super cool image! Love your dramatic processing! Magnificent capture and a very beautiful rainbow. Magnificent capture! An absolute FAV! Fav for this dramatic, moody shot! Oh it looks so ominous, like calm before the storm -cool processing! This is a spectacular rainbow! One of the best I have ever seen! The way it shines through the clouds ...and those clouds!! Huge FAV!!! @cazann Caz, thanks so much for your visits and comments today! I really appreciated them -- you are so positive!